​Like hundreds of towns across Pennsylvania, Kulpmont, a borough in Northumberland County, was built around an industry that provided a livelihood for generations of families, but also left behind a troubling environmental legacy as that industry receded. This October, local students dove into their past and took action to help build a healthier future for their community through a day-long field trip focused on coal mining heritage and water quality. “We show students their past, how this city grew with the coal industry, the environmental debts that were left behind, what a healthy perennial stream looks like, and what we can do to fix an impacted stream now,” said Chantel Shambach, Watershed Specialist with Northumberland County Conservation District, who served as the event’s primary organizer. The annual Coal Mining History and Water Quality Field Trip began in 2016 with support from the Pennsylvania Department of Environmental Protection’s Environmental Education Grant Program, and is made possible by the Shamokin Creek Restoration Alliance (SCRA) and other local business and non-profit partners that work together to provide the necessary resources and funding. The watershed group sees the annual event as a prime opportunity to teach the next generation about its goal of returning the local creeks to a healthy state and sustain native fish and aquatic life. The day’s schedule rotated small groups of students through stations in multiple locations in the community, creating a fast-paced and immersive experience. Volunteers from the diverse sponsoring organizations provided educational lessons and demonstrations at each stop. The tour began in Kulpmont, where participants viewed a historic mural of the Scott Colliery, around which much of the once-company town was built, and learned about coal history from SCRA volunteers; observed the site of Quaker Run, in whose channel coal was first discovered in 1790 before it was redirected and heavily impacted by the coal industry; and walked through Veterans’ Memorial Sports Complex, built on the former colliery site after an extensive land restoration process. A 20-ton monument known locally as “Stonehenge” now stands at the complex to mark the discovery of coal. “This is a wonderful area to convey to students an idea of how the environment was changed so drastically, how that stream was once a perennial stream and now is no longer running unless there is a large rain event, and learn why other waterways in their area are orange from acid mine drainage,” said Shambach. 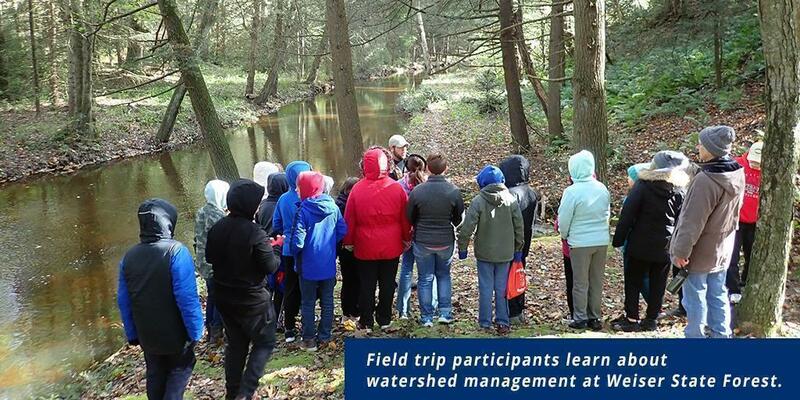 A short bus ride to Weiser State Forest took students into a natural learning lab, with stations demonstrating macroinvertebrate sampling and identification, forested riparian buffers, healthy stream channels, and watershed management. Students could instantly visually compare the natural, wooded stream at the state park with the severely degraded Quaker Run. The day ended with students returning to Veterans’ Memorial Sports Complex to put all they learned into action and get their hands dirty by planting 60 trees and shrubs along Quaker Run to help accelerate its recovery. A total of 80 middle- and high-school students from Mount Carmel and Our Lady of Lourdes Regional Catholic School participated in the October 2018 field trip. The Conservation District and SCRA hope to include additional schools in the future. They also plan to seek potential locations for future riparian buffer plantings, because the Quaker Run site is nearly full, thanks to the outstanding survival rate of past years’ plantings. Jaci Kerstetter, Conservation District Field Representative for DEP’s North-central Regional Office, emphasized the value of community connections in environmental stewardship and education. “The continued efforts of local groups planning this event for several years running shows this town’s support for upcoming conservation leaders with real knowledge in outdoor experiences,” said Kerstetter. The 2019 Environmental Education Grant round recently opened​, with applications accepted through January 11, 2019. The intent of the Pennsylvania Environmental Education Act, which created the grant program, is to promote environmental education principles that encourage the public to promote a healthy environment, foster an understanding of the natural world, and promote an understanding of the necessity for environmental protection and sound resource management.